I got the Hot Class Tank in Aruba/Coal the other day and was a bit torn between sizes so I thought I’d share. I tried on the size 8 (this one is an 8, TTS) in store and thought it showed too much love handles on the sides so I also tried on the size 10 which was bigger in the body but too loose in the bra portion. I decided at the last minute to stick with the size 8 as I’m training for a half marathon and don’t want to be stuck with a too big tank that I love and can’t bare to part with. After getting home and trying it on again I don’t think the size 8 looks bad at all and I feel quite comfortable wearing it now as is. I find this tank is not supportive enough for any kind of intense work out such as running but as a Hot Yoga Tank or lounging tank I really think it’s fine for small to medium sized busts. I don’t have any cleavage spilling out of this and I’m a 36C (on good days) so I don’t think it’s scandalously unsupportive or low cut. 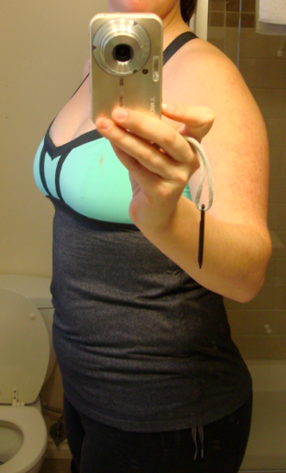 I really love bras made of luxtreme with circle mesh liners which is what the Aruba portion of this tank is. The bottom portion of this tank which is sheer luon feels amazing and after realizing that the Silverescent Hot Class Tank version in all black uploaded this morning was made out of a circle mesh bottom and Silverescent Luon top I decided that I just really want a solid colored one with the exact same materials used in this tank. There is a Luxtreme/Sheer Luon all black version in some stores but not at my local store just yet. The Sheer Luon is really an amazing material and feels soft like a very worn in thin pima tee. Solid Aruba, Beachy Green, Margarita or Rubber Ducky would be gorgeous in this tank and I would probably get one more if it came in any of those colors! 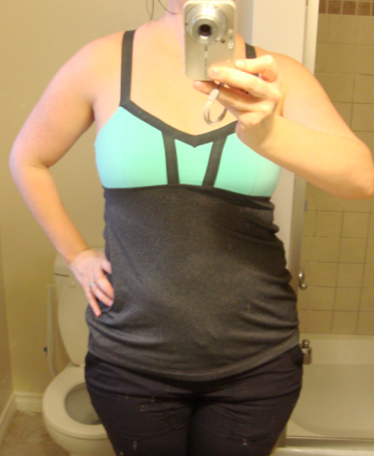 This is my new top favourite tank and I do plan on actually using it to Bikram’s Yoga on my monthly excursions. just noticed splotchy mirror. Oops!